Are you looking to create an ergonomic workstation space in your office? Do you want to avoid repetitive stress injury, or neck and back pain? Start with your chair. The chair is one of the most important component of your ergonomic workstation. The chair has to assist you in attaining an ideal work posture (keeping in mind you should work with your elbows at a somewhat right angle - as we’ll understand more in point 2). This means you have to have sufficient back support, the ability to move closer to your desk if needed, and sitting with your legs at a somewhat right angle. Of course, the space of the seat has to be adequate and the padding adequate to relieve as much pressure as possible. Some important points to consider when choosing a chair is to adjust it to fit your body when you sit in it, and to make a right angle with your legs. This is the ideal position to prevent additional stress when working at your desk. If your feet are not touching the ground, you’ll need an additional footrest. However, you have to ensure that the footrest is at the exact height, otherwise you’ll cause stress to other areas. The easiest way is to place a stack of phone books and adjust them accordingly. Another problem with desk chairs that I’ve found is the lack of adjustment in armrests. Most of them are not at a correct height and may cause strain to your shoulders. Furthermore, after adjusting your chair ergonomically, I’ve often found that armrests prevent you from moving closer to the desk. I recommend buying a chair with adjustable armrests height or doing without the armrests altogether. Check the angle of your elbows to your desk. There is no point of making your whole office space ergonomic if you don’t know the best and most efficient way to use it. Now that you have adjusted your chair (see point 1 above), this allows you to work at the computer with your elbows in a relaxed manner of 90 degrees or more. Most people work hunched forward with their elbows bent at less than 90 degrees. This is bad for their posture, neck, shoulders and eyes. Although I’ve recommended to start by adjusting your chair in your application of ergonomics - another good way is to position your elbows and THEN adjust your chair to what you need. With an ergonomic keyboard like the Microsoft natural keyboard, you’ll find your shoulders, neck and elbows attain a more relaxed position, enabling you to work more efficiently. Adjust your Monitor Height. 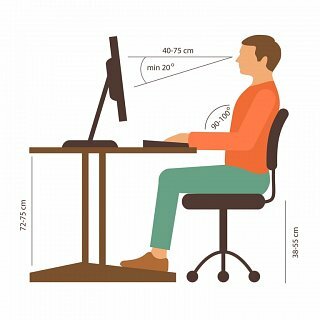 After you are sitting comfortably at your desk with right angles in your elbows and knees, the next thing to do is to adjust your monitor. It is often too low  and Laptops are the worst offenders. Looking down for an extended period of time causes neck strain. It also encourages a hunched, forward neck posture. There are several monitor stands that you can buy to elevate the height of the monitor to the right height. Monitor stands are handy if the computer is shared by a number of people and you can just tug it to the right height whenever there is a change of users. However, if this option is not available to you, similar to the foot rest, just get a stack of books - it may not look pretty, but it works. Do you have sufficient light? Ensure that you have sufficient light when working. It’s best to have multiple sources of light in a room, glowing rather than shining brightly. Beware of glare, especially if a desk lamp is too bright or if you have spotlights directly above you. The shadows they create in contrast to the bright lights are not comfortable for your eyes. Take More Breaks. You may have the most ergonomic work station, with the right chair, monitor, mouse, keyboard and sufficient lighting but you must still take responsibility of how you work. Look away from your monitor every half an hour and rest your eyes by looking at something far away or something green. You may close your eyes for a few seconds too. Get up and move about - alternate your tasks. Do some writing, filing, photocopying, plan some meetings or use the restroom. Sitting in one fixed position or being in a fixed position for too long using your mouse can only increase your chance for injury like repetitive strain disorders or carpel tunnel.